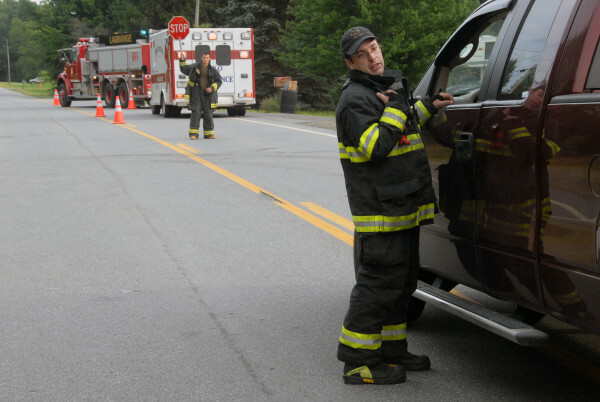 LaGrange Assistant Fire Chief Mike Bacon stops a vehicle near 5572 Bennoch Road in LaGrange, Aug. 3, 2014. A three-hour standoff ended when a Maine state trooper shot and killed Lewis Conlogue outside the former Highland Restaurant in LaGrange, Aug. 3, 2014. BANGOR, Maine — The widow of a LaGrange man shot and killed in August 2014 by a Maine State Police sergeant has filed a wrongful death lawsuit in Penobscot County Superior Court. 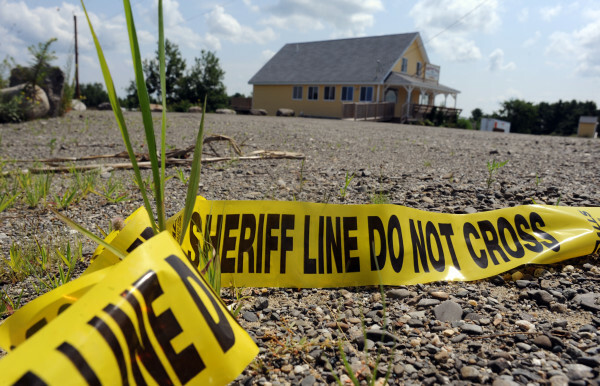 Lewis N. Conlogue, 49, was shot and killed Aug. 3, 2014, after a confrontation with police outside the former Highland Farm restaurant, located on Route 16 in LaGrange. DanaRae L. Conlogue of Florida is seeking unspecified damages for use of excessive force, loss of life, medical and funeral expenses, loss of future earnings and wages, conscious pain and suffering and fear, and physical pain and suffering and emotional trauma and suffering. Her attorney, Hunter Tzovarras of Bangor, filed the complaint last week. The defendants are four members of the Maine State Police: Sgt. Scott Hamilton, who fired the fatal shot, Sgt. Ted Millett and troopers Taylor C. Dube and Tom Fiske. All were at the scene of the standoff, according to the complaint. The Maine attorney general’s office on March 9, 2015, found that Hamilton was justified in his use of deadly force. Timothy Feeley, spokesman for the Maine attorney general’s office, said Monday in an email that his office, which is charged with defending the state employees, has received a copy of the complaint. “We have no comment on this pending matter,” Feeley said Monday in an email. It is the practice of the office not to comment on pending litigation. The standoff began after Lewis Conlogue and his wife allegedly had an argument while driving to their home in LaGrange. DanaRae Conlogue, who was driving, pulled into the restaurant parking lot after her husband threatened to jump from the moving car. She called 911 after he got out of the car and pointed a gun to his head. Lewis Conlogue reportedly was depressed over health issues that kept him from working. The actions of Conlogue once police arrived as outlined in the complaint conflict with the facts described in the attorney general’s report on the shooting. The report said Conlogue died of a single gunshot wound but did not explain where the bullet entered his body. The complaint alleged he was shot in the back while walking away from the police. The attorney general’s office has 30 days to file an answer to the complaint. A trial date is not expected to be set until next year. Correction: An earlier version of this story incorrectly reported where DanaRae L. Conlogue resides. She lives in Florida.